Today at work (I am a general practice doctor) I was doing a procedure and had a tourniquet on a lady's toe to control any blood. At the end of the procedure, I figured all of the blood was clotted and snapped the tourniquet off. Yeah, so I forgot that she was on a blood thinner and blood went flying across the room. Its a good thing that I was wearing a bright white shirt that now sported a nice thin splatter of blood across it. Just a note, if you get blood on your white (or any color) shirt, Hydrogen Peroxide if applied quickly will get the blood out of the shirt amazing well. 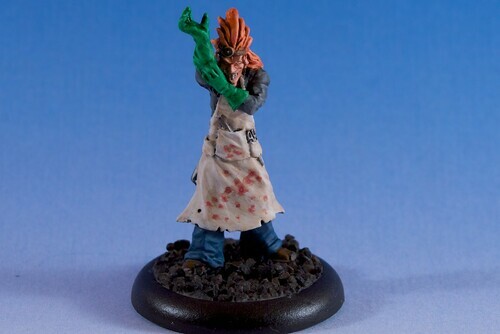 Here is a miniature I did awhile back- take note of the blood stains. Its not bright red. Blood especially in small amounts dries brownish-red. Its matte. And it usually hits you in a spray like manner, not a huge clot- especially if it came from an artery or from a punch in the face from a space marine. Too many times I see blood represented as a big red bloob. That only happens when you make huge cuts and leave large amounts of blood together to clot (or congeal). "How does it land... does it drip.. what color is it... is it matte or varnish..." Hahaha, that's great! But in all fairness to the big blob method of painting blood splatters, I imagine a chain-axe or powerklaw probably would create some rather large wounds. Might be why World Eaters never bother to stock their med kits with gauze... I mean, what would be the point? Excellent advice all around, hopefully though I won't need to use your tip about laundry any time soon. Still, if a WE cut you big time with a huge chain sword- first off blood would splatter all over the place since you'd be hitting a lot of arteries at first. Once the victim is down and well dead, yes blood would start to pool. But on the offending chain sword you wouldn't see a huge collection of blood, just the splattering. If you haven't seen Spartacus: Blood and Sand on Starz- there are some pretty 'cool' gladiator scenes in which blood sprays and flows in all sorts of fun and educational ways. But now I am starting to sound like a sicko! Sicko... yeah, I think that boat sailed a long time ago. Thanks for the Spartacus tip, I haven't seen any of it yet but I want to. For some reason the wife doesn't seem too interested. But I appreciate you making me think of Airplane, "... do you like Gladiator movies?" I'm curious about this splatter on the chainsword. You're saying a realistic splatter pattern on the weapon itself would be more like lots of little droplets everywhere? What about a bunch of thin streaks?